“Although this is principally a sad day, on which we mourn Danny’s passing, it is also an opportunity for us to celebrate his life which touched and enriched us all,” said George Foulkes MP last Saturday morning. He was giving the eulogy for former Provost of Kyle & Carrick District Council Danny MacNeill BEM JP during Requiem Mass held in the Sacred Heart Church, Girvan. The service was conducted by Canon Eugene Mathews assisted by three concelebrants. Mr Foulkes added that it was a “great privilege to have been asked by the family to say a few words about Danny on behalf of his multitude of friends”. He also extended everyone’s good wishes to Agnes, Danny’s wife, who had taken ill following his death and was in the Western General Hospital in Glasgow and unable to attend the funeral. Danny was called up in 1946 and joined the Royal Engineers, resettling prisoners of war. After his National Service, on being demobbed, he joined British Rail. He naturally joined the National Union of Railwaymen and worked his way up to union representative and then became the local union secretary, service for which he received the British Empire Medal. 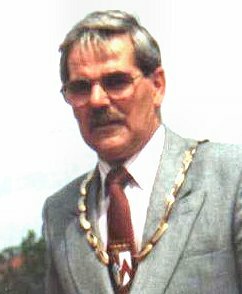 “Locally he was one of the most active members of this church as a devout and active Christian; as chairman of the Girvan Sports Association; as a Justice of the Peace – all of which were recognised when he became Carrick Citizen of the Year.” Mr Foulkes the spoke about Danny’s time as Kyle & Carrick councillor for Maybole and quoted Ian Welsh, Council Leader at the time. In conclusion Mr Foulkes said, “Danny was a man of great ability, and a modesty which masked it. He was a man of great kindness and compassion and found a myriad of ways of expressing them. He was also a wise man – I learned a lot from him over the years and I am sure all of you will have too.